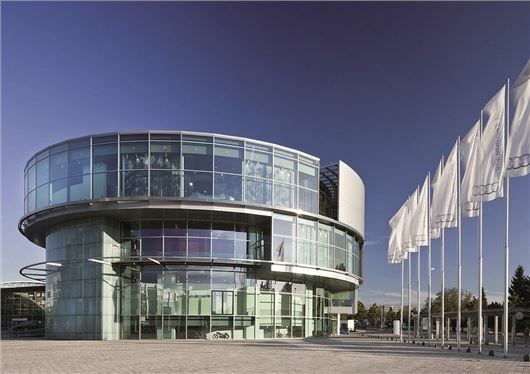 The Audi factory in Ingolstadt, Germany, is the place to go if you're interested in the birth, development, and evolution of the various German companies that ended up combining to form the the company today. Given that it's at the very heart of the company's Headquarters, and also serves as the place to go for many customers picking up their new cars from the factory, it's extremely corporate in its presentation - with the chrome and glass ultra-modern building providing quite a contrast to the exhibits inside. As well as housing the Audi Tradition collection, and displaying selected cars from it, you can take a factory tour as an interested observer, or while collecting your new car. Seeing new A3s, A4s and A5s rolling off the line after the intricate production processes that turns raw metal (well, various grades of steel and aluminium) into finished cars in a 30-hour process is fascinating. Very fascinating. But for most readers of this site, chances are that the most interesting part of any visit to Ingolstadt will be seeing the Tradition collection up close. Audi's history is long and complex, and arguably, the company we know today has only really been around since the late 1960s. But the Audi story is a lot older than that, with August Horch's car company, which saw the light of day in 1904 being the starting point for where we are today. He'd been the production manager for Karl Benz, when differences with 'Old Man Benz' had effectively forced him to go and do his own thing instead - but he didn't have full rights to the Horch name (but regained them later), instead taking the Latinised version of it, Audi, from 1910. The company hit the skids during the Great Depression, and ended up merging with Wanderer and DKW, to form Auto Union. And it's here that the four-ring logo was created. And it's here that the musem proves invaluable for those into the history of Audi - because it has examples of all four companies - Horch, Audi, DKW and Wanderer - on display, with solid histories of all to read. There are some fine examples of the luxury Horches on display at the museum (as well as the August Horch museum in Zwickau), and it's impossible not to be impressed by the sheer size and scale of these cars. For those not too conversant with these cars, there are plenty of places to read up on them. There are wall descriptions, videos and story boards placed strategically, but there are also regular museum tours, too. And don't worry, there are English translations, as well as tours in our language as well as German. Of course, a big part of the Audi collection are the amazing Ailver Arrows racing cars. Ferdinand Porsche comes into the story at this point, working on the mid-engined V16 Auto Unions, which - along with Mercedes-Benz, went on to dominate Grand Prix racing in the lead-up to WW2. The cars were scattered to the four winds after the war (and in recent years, Audi has worked hard to re-secure them), and Auto Union refocused into DKW, which ended up building some very impressive small two-stroke family saloons. Our favourite exhibit - pictured in the gallery below - is the Horch 853, which thankfully remains in its rusting, patinated condition, as found in Texas a few years ago. It's the final Horch made in 1953, and was built by the engineering department as a gift for the head of the company, Richard Bruhn. It was hand-built, based on a 1939 Horch chassis, and clothed in a bespoke, and rather beautiful body. The car was unearthed in a breaker's yard in Texas, and sat in Al Wilson's collection for years before Audi Tradition identified it, and returned it to Germany in 2009. The later history of Audi is wonderfully documented in the museum, too - with the DKW F103, and its four-stroke Audi 60, 70 and Super 90, lining up to show the modern company's beginnings exceptionally well. Then we see the 100, 80, 50, and quattros line-up to show a very ordered and logical evolution from this point in time. The NSU Ro80 is a highlight that shows us what might have been had history been kinder to one of the most advanced cars built. We wonder if pushy executives today might well be driving NSUs and not Audis, had we not had an Energy Crisis, and they'd sorted the rotor tip problem before launch in 1967. A highlight is the motorised rotisserie, which revolves a selection of cars over the three-storey building, and will stop pretty much any visitor in their tracks. It's a great day out for petrolheads as well as Audi enthusiasts, and free to enter. Most people are going to gravitate towards the impressive motor sport cars on display, especially the quattro in Group 4 configuration, the IMSA Audi 200 saloon, and the still-born Audi Group S rally car. The company revolves its exhibits, so if you've already been, there's plenty of reason or making a return visit.